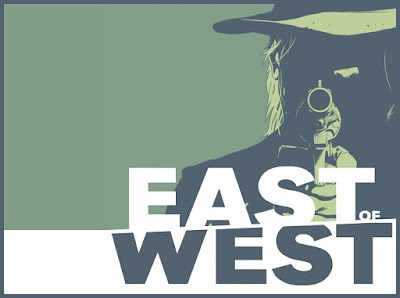 East of West is the last item on my Comics to Check Out list. It came highly recommended from multiple people. I honestly can see why. It has a fascinating story with and interesting and deep mythos behind it. There are secrets to uncover but it explains enough to keep drawing the reader along. And it didn't click with me. This is one of those situations where I can objectively see the good in this but I personally don't really like it. I think it mostly comes down to the setting. The setting is a cross of multiple genres, but most of them I don't like, especially Westerns. And it seems like Western is the main genre for the whole series despite the fact that it's mixed with Sci-Fi, Kung-Fu, Civil War, and modern day. So... yeah. You should probably check this one out if anything I've said has peaked your interest, but I'll be stepping away from it after only reading the first volume.